Love them or hate them, Brussels sprouts are the mainstay of any traditional Christmas dinner, and if by some strange quirk you actually do love them, then they are also perfect for roast dinners too. 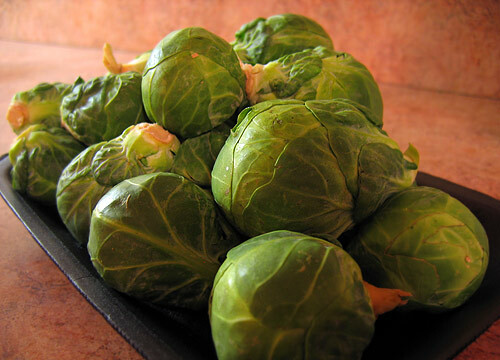 But why is it that such an obviously English vegetable is called Brussels sprouts – surely, London sprouts would be a more appropriate name? Well, it’s because Brussels Sprouts have been cultivated in Belgium as far back as 1200, hence the name, and for those who don't know - Brussels is capital of Belgium. Brussels Sprouts are best known today as the least popular part of the Christmas lunch, yet given that they are of a decent quality and cooked properly they are not only delicious, they are also an excellent source of vitamin C, vitamin D, folic acid and dietary fibre. Furthermore, Brussels sprouts also contain health-promoting compounds called glucosinolates which may help to prevent cancer, so you can almost call them a superfood! Sprouts are very tolerant of almost all soil conditions although they dislike acidic soils which can make them more susceptible to clubroot. Because Brussels sprouts are a ‘top heavy’ crop, they are best grown in a rich, firm, heavy soils in order to enable the root system to support these top heavy plants, stopping them from falling over in poor weather. Their final bed should be nicely dug over with plenty of well rotted farm manure added to it well in advance of planting – preferably completed a few months earlier. They will grow equally well in sun or partial shade, but prefer partial shade. With that in mind, try to avoid growing them in front of other plants which need full sun, their foliage will put others in the shade. Brussels Sprout seed should be sown around the middle of April, directly into a seed bed outside or containers filled with potting compost. This helps the plants to produce a better root system and crop when they are planted in one place and transplanted to their final position a month or so later. Brussels sprouts seeds should be sown half an inch deep and 4 inches apart. Cover the seeds back with the surrounding soil and give them a good watering. Germination should occur in about 10 days, but this can be a few days longer in cold weather. 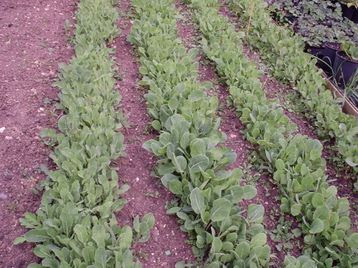 Once all danger of late frosts has passed, usually by the end of May, the seedlings should be about 5 inches high and ready to be transplanted into their final position. The soil should have been well-dug a couple of months earlier, giving time to allow the soil to settle. Taking care to disturb the root systems a little as possible, plant them in rows (2ft) apart. Ensure the soil is firmed back and if at all dry water well - a shortage of water at this stage will almost certainly affect the health of the plants, and definitely the taste, later on. The key thing when growing Brussels sprouts is to make sure that they do not run short of water. Hand weeding (their roots are shallow and easily damaged) will also be necessary. Unless the soil is very poor, do not feed with any additional fertiliser, this will only result in leafy sprouts, although a mulch of well-rotted compost can do the world of good. A hard frost always improves the eating quality of sprouts, so you will have to judge this according to where in the world you live. When harvesting, remove the Brussels sprouts from the main stem using a knife - simply breaking them off will injure the main stem. Take the lowest sprouts first and work up the stem as required. Do not remove all the sprouts from one plant and then harvest from the next plant - the lower sprouts mature earlier than the higher ones.